This is my second time working for Organised Chaos, after playing the Role of ‘Clerk’ in a tour of Michael Hart’s ‘AfterWords’ in 2012. I had a fantastic time on the show, so much so in fact that I’m back for more in this years’ tour of Ella Greenhill’s Broken! Playing ‘Clerk’ last year was a real pleasure. We got some great feedback from audiences, (including a lovely 4 star review from ‘What’s On Stage’) a Best New Writing award from the Buxton Fringe and I got the opportunity to work with some fantastic people, including our Director Phil Minns who I worked with again recently on ‘Me, as a Penguin’ at the Houldsworth Rep Theatre. When I was 1st asked to read Ella’s script for ‘Broken’ I immediately wanted to be involved. I think it’s a really interesting way of exploring the issues surrounding mental illness, (& another great character to sink my teeth into!) The opportunity to perform at the Lowry and The Oldham Coliseum (and revisit some of the great venues from our last tour) was something I couldn’t pass up either! I have worked as an actor for nearly 10 years now, spending a large part of my career in the West End and National Tours of Blood Brothers. However, when I moved back up to Manchester I almost felt like I was starting from square one again. Working with Organised Chaos has given me a great platform to showcase myself in the North West. I’m already really enjoying working on ‘Broken’ and can’t wait to hear what our audiences think of the show. Hope to see you all on tour! This entry was posted in Actors, Introducing, Production: Afterwords, Productions and tagged broken & a lot of it about, karl greenwood, lantern theatre, lowry theatre, manchester theatre, new writing, oldham coliseum, organised chaos productions, paul anderton, pavilion arts centre, una love on April 16, 2013 by sarahgracelogan. Ben plays The Clerk for AfterWords – he joined us after answering an open call. So last night was opening night. After months of preparation, it’s a real pleasure putting the show in front of a live audience. My character, the Clerk, is a joy to play. He’s a bit of a jobsworth, but with a softer side. Think Saint Peter waiting at the pearly gates, only more annoying. Lots of delightful lines from Michael, the writer. I also get to eat on stage, and even wheel out my (rusty) Tom Jones impression. The audience seemed very receptive, and gave lots of positive feedback. In particular, people really love the concept of the show, the nature of the afterlife and what it suggests about our lives (again, kudos to the writer). At this point, there’s a wonderful sense of reassurance. As show week approaches, everyone has moments of doubt, but these are fast fading. We’ve put it on stage, we know it works, and we know people like it. Hope you do too, if you make it down! This entry was posted in Actors, Introducing, Production: Afterwords, Productions on May 17, 2012 by organisedchaosproductions. Adam plays Andrew for AfterWords – he joined us after answering an open call. As an actor in Manchester there is a tick-box list of local groups and companies everyone aims to work with at some point, Organised Chaos being one of them – so it’s great to finally get a chance to join the OC hall of fame. In After Words I play Andrew, who is (not quite) patiently sitting in the afterlife waiting room, desperate for his number to be called, waiting his turn to… well he hasn’t thought that far ahead, but they better bloody well hurry up anyway! With Andrew I’m getting the rare opportunity to be the comic relief of the piece, being something of an emotional bookendin the process. At the mercy of the Clerk’s mind games,Andrew contemplates eternity chained to a kindle or sat in front of the TV while he crosses his finger that his Mrs will pops her clogs before her time to end his waiting. Its been a real treat working with our Director Natasha Stott and my good friend Ben Jewell, playing the Clerk, to bring out the comedy to be found in Andrew’s endless monotony and limitless boredom. The cast and crew have gelled really well and everyone adds something to the mix – that’s the privilege of the job of an Actor I think: working with dedicated, invested individuals who take what they do seriously and having loads of fun in the process. Its also nice to be able to turn up for work and spend most of your time laughing. As you probably know, it’s show week and everything is coming together nicely. There is an air of confidence in the company that I’m sure will translate into a really great piece of work and maintain the high standard Organised Chaos is known for. So, bring your friends! This entry was posted in Actors, Introducing, Production: Afterwords, Productions on May 14, 2012 by organisedchaosproductions. Natasha is the director of AfterWords – she joined us after answering an open call. She was asked to write something about why she wanted to get involved with us and our production of AfterWords and her experience so far. Organised Chaos by name, Organised Chaos by nature! From the moment I saw the call out for directors by such an aptly named company I knew I had to apply. Afterwords has a contrasts of journies, contradictions of characters with each scene a heartbeat of the Afterlife. My process began with the building around the stages of grief and the diffence between what we want and what we get. I met Ellie (designer) at the interviews, straight away we began talking about the possibilities of the script with an instantaneous realisation that we shared a very similar vision of the endless and exciting themes and juxtapositions this script lent it self to. The auditions were lengthy, but worth it. Actors embraced roles and voiced insights, discovered connections helped, even in this early stage, with the developement of the piece. The Rehearsal process was a journey of continued discovery for all involved and more recently started to take shape once we began to run it. With actors of book, scenes down, production team creating projections, SFX, making props etc. With less than a week to go, I think I can speak for everyone when I say we are united and simultaneously excited. This entry was posted in Directors, Introducing, Natasha Stott, Production: Afterwords, Productions on May 14, 2012 by organisedchaosproductions. Laura plays Julie in AfterWords – she joined us after answering an open casting call though joins us again having played Casey in our production of All Because Of Molly last year. Hello OC Bloggers! Is that what you’re called? – I don’t know, I was just trying to be hip and down with the kids. But I am not cool. I am too old to be young and cool. So I will stop. However, those kind of shenanigans are quite apt for this production – I play Julie – who is 71, but is reincarnated in the afterlife as a 27 year old. The chronology of the piece has been a bit mind-bending in rehearsals, but we’ve enjoyed exploring how relative age and the passage of time alters relationships. I love this play, I think it is really clever and thought provoking. Julie is a great part and I feel really privileged to be playing her. I’m loving working with the rest of the cast and the director to bring the story to life. 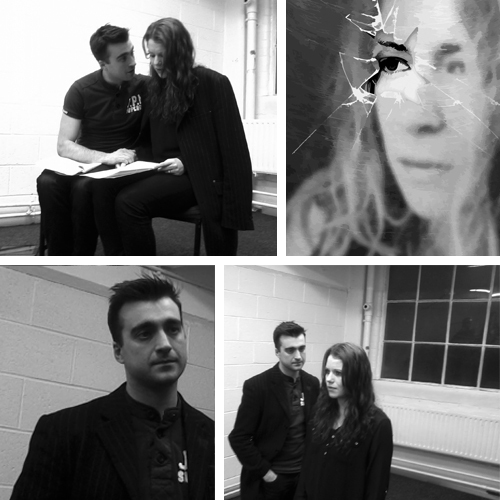 We’ve had some really interesting and philosophical discussions in rehearsals about the issues this play deals with. It deals with the very basis of humanity and existence. No really it does. Come watch it, you’ll see! This entry was posted in Actors, Introducing, Production: Afterwords, Productions on May 8, 2012 by organisedchaosproductions. Jack plays Dad in AfterWords – he joined us after answering an open casting call. He was asked to write something about why he wanted to get involved with us and our production of Bottled Wasps and his experience so far. Hì guys! Dad here! Also known as Jack in real life. Í’m writing my first ever blog from thè comfort of my living room where I am recovering from a hip replacement. Its been a bit of a strange period thè last couple of weeks as i’m trying to rehearse my lines and develop a character that is actually 23 yet my body has been feeling like that of a 93 year old! But there in lies thè twist. Despite thè Dad being in a 23 year old body he is actually 96! This is what happens in thè Afterlife. Come and see thè play and all will become clear ! I’m on thè mend now and with rehearsals ramping up i’m sure all will be well for opening night! Thè cast and thè crew seem to be gelling very well and we also got thè chance to meet Michael, who wrote thè script, thè other week, which was very insightful! Well, i’m off to learn my lines and then go for my daily walk! From thè streets of Stretford, this has been off thè record, on thè QT and very hush-hush ! ! ! This entry was posted in Actors, Introducing, Production: Afterwords, Productions on May 7, 2012 by organisedchaosproductions.